Is the first transparent phone clearly just a gimmick? LG GD900 Crystal - how does it measure up? LG has pushed the design boat out again, this time bringing the world's first transparent phone in the touchscreen GD900 Crystal. 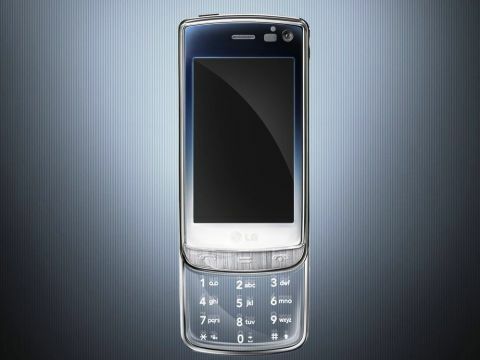 However, this model isn't beating Apple or Google's Android at its own game - this is about pushing the boundaries of what's possible in a feature phone, and to that end has included an 8MP camera, LG's nascent S-Class interface and a sliding (lest we forget, transparent) touch-sensitive keypad to make things a little bit more special. The phone itself is pretty solid, despite being mostly made of plastic. What's interesting is the piece you'd expect to be flimsy is actually the most sturdy - the slide out keypad is made of glass, and not plastic. The keys are top-lit by an LED array, and the whole thing is encircled by a metal frame, which really gives the phone a touch of elegance. The battery cover, which is also transparent so as not to block the effect, is a little more flimsy and is made of plastic (allowing a view of the stylised battery underneath), although it has a unique hinged clasp to release it from the chassis of the phone. The slide action is firm and secure, thanks to the glass, which adds a pleasant weight to the device, which is actually only a sprightly 127g. In terms of buttons on the phone, there's only the normal up / down key and the camera button, which positioned centrally in order for it to move to the correct position when the slide is used. There's also a power switch at the top, which activates sleep mode, and three touch sensitive buttons: call, opening the cube interface and terminate, under the screen, with a similar (if more sensitive) feel to the LG BL40 Chocolate. A sad point - we lost track of the amount of times we accidentally brushed the terminate key while using any number of applications, shutting them down instantly. It's best to learn to hold your breath when using the GD900 Crystal lest you accidentally call your Nan or something. The camera itself, an 8MP effort with flash, is under the slider as well, so there's no way to use the LG GD900 in closed mode when taking a picture. Another neat design feature is the fact the microSD slot (which can munch up to 32GB of creamy data goodness), traditionally hidden beneath the battery or a closable door on the chassis, is under the slider as well, so giving easy access to hot swap cards. There's sadly no 3.5mm jack on the phone, with only a double hinged door hiding a microUSB slot for an adaptor and also the charger (although the build quality is solid on the covering - it's certainly unlikely to break off over your time with the GD900). A front facing camera peeks out of you from the front of the phone, showing that although the high end smartphones might not want it (think Toshiba TG01, HTC Hero and Apple's iPhone 3GS) LG still thinks people are after the chance to look at their buddies as they chat. LG has supplied all the bits and pieces you'll need in the box with the GD900, which is a little smaller than most packaging these days (although not as teeny as the Hero or HTC Magic). We get a microUSB charger, a PC connection lead and adaptor (both also microUSB). There's the perfunctory manual (although no person should ever stoop to using it... that takes all the fun out of the game) and computer software too, and of course the phone with battery. But we assume you knew that already. LG has also packed in some OK earbuds for listening to your choons and video, although with the adaptor we'd expect you to upgrade these fairly sharpish. They're a lot better than the ones supplied with the iPhone, but they're not as good as those given with the latest in the Samsung range.